Kachin State (Kachin: Jingphaw Mungdaw; Burmese: ကချင်ပြည်နယ်) is the northernmost state of Myanmar. It is bordered by China to the north and east; Shan State to the south; and Sagaing Region and India to the west. It lies between north latitude 23° 27' and 28° 25' longitude 96° 0' and 98° 44'. 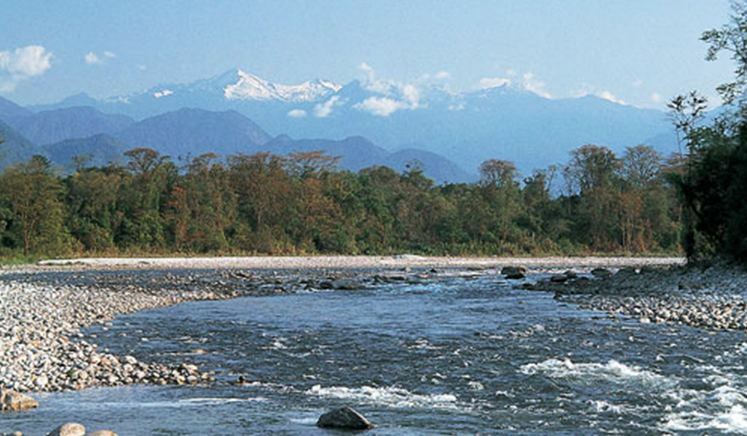 The area of Kachin State is 89,041 km2 (34,379 sq mi). The capital of the state is Myitkyina. Other important towns include Bhamo, Mohnyin and Putao. Kachin State has Myanmar's highest mountain, Hkakabo Razi (5,889 metres (19,321 ft)), forming the southern tip of the Himalayas, and a large inland lake, Indawgyi Lake. Traditional Kachin society was based on shifting hill agriculture. According to "The Political Systems of Highland Burma: A Study of Kachin Social Structure", written by E. R. Leach, Kachin was not a lingusitic category. Political authority was based on chieftains who depended on support from immediate kinsmen. Considerable attention has been given by anthropologists of the Kachin custom of maternal cousin marriage, wherein it is permissible for a man to marry his mother's brother's daughter, but not with the father's sister's daughter. In pre-colonial times, the Kachin were animist. The Burmese government under Aung San reached the Panglong Agreement with the Shan, Kachin, and Chin peoples on 12 February 1947. The agreement accepted "Full autonomy in internal administration for the Frontier Areas" in principle and envisioned the creation of a Kachin State by the Constituent Assembly. Kachin State was formed in 1948 out of the British Burma civil districts of Bhamo and Myitkyina, together with the larger northern district of Puta-o. The vast mountainous hinterlands are predominantly Kachin, whereas the more densely populated railway corridor and southern valleys are mostly Shan and Bamar. The northern frontier was not demarcated and until the 1960s Chinese governments had claimed the northern half of Kachin State as Chinese territory since the 18th century. Before the British rule, roughly 75% of all Kachin jadeite ended up in China, where it was prized much more highly than the local Chinese nephrite. 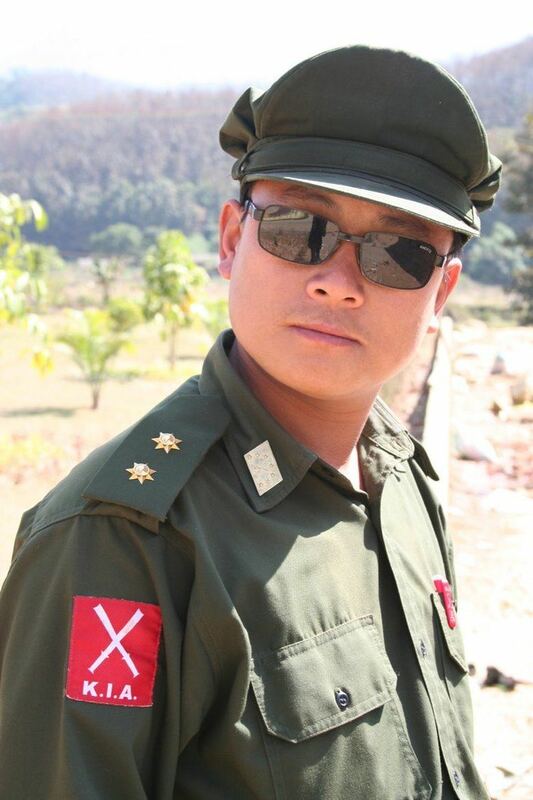 Kachin troops formerly formed a significant part of the Burmese army. With the unilateral abrogation of the Union of Burma constitution by the Ne Win regime in 1962, Kachin forces withdrew and formed the Kachin Independence Army (KIA) under the Kachin Independence Organization (KIO). Aside from the major towns and railway corridor, Kachin State has been virtually independent from the mid-1960s through 1994, with an economy based on smuggling, jade trade with China and narcotics. After a Myanmar army offensive in 1994 seized the jade mines from the KIO, a peace treaty was signed, permitting continued KIO effective control of most of the State, under aegis of the Myanmar military. This ceasefire immediately resulted in the creation of numerous splinter factions from the KIO and KIA of groups opposed to the SPDC's sham peace accord, and the political landscape remains highly unstable. Renewed fighting between the Kachin Independence Army and the Burmese army began on June 9, 2011 at Ta-pein hydropower plant and continued throughout 2012. Initial reports suggested that from June to September 2011 a total of 5,580 Internally Displaced Persons from 1,397 households arrived at 38 IDP camps under Myanmar Government control. In August, 2012 thousands of Kachin refugees were forced by the Chinese Government back into Myanmar despite the continued fighting there; NGOs like Human Rights Watch called to cease such action and pointed the illegality of doing so under international law. As of October 9, 2012, over 100,000 IDPs are taking shelter in various camps across Kachin State. The majority of IDPs (est. 70,000) are currently sheltering in KIA controlled territory. Fatality estimates were difficult to estimate but most reports suggested that between government troops, Kachin Independence Army rebels, and civilians upwards of 1,000 people had died in the conflict. Even though many Kachins were already displaced internally, only around 150,000 people are reported as IDPs. The Kachins are currently the major target for the Burmese government, yet only few Kachins have resettled in the United States or in Australia, as compared to other Myanmar ethnics (such as the Karens and Chins). The majority of the state's inhabitants are ethnic Kachin. 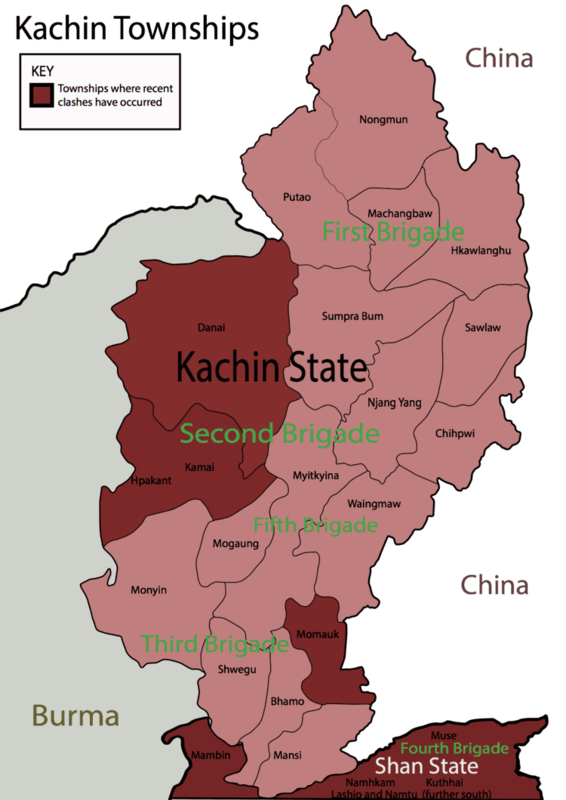 The Kachin group has six tribes or subdivisions: Jinghpaw, Lisu, Rawang, Lachid, Zaiwa and Lhaovo. The word "Jinghpo Wunpong," which means "Strong and United Human Beings", also represents the six Kachin tribes. The region is also home to a number of Shan and a small number of Tibetans. Christianity is the main religion for Kachin people in Kachin State. However, Buddhism is the major religion among the Bamar immigrants and Shan people in Kachin. The Jingpho language was the traditional language of the area, and is the state's lingua franca. The Bamar people (Burmese) were a minority in Kachin State before the independence of Burma from the British, but after 1948, groups of Bamar (Burmese) came to Kachin State to settle down so that offices could be run with the Burmese language, which has caused language shift and commenced the decline of the Kachin language.Many later Kachin generations did not have a chance to speak or learn their language properly at school. Some Kachin tribes speak and write their own language: the Zaiwa, the Rawang, and the Lisu, who speak both the Lisu language and the Lipo language. The economy of Kachin State is predominantly agricultural. The main products include rice, teak, sugar cane, opium. 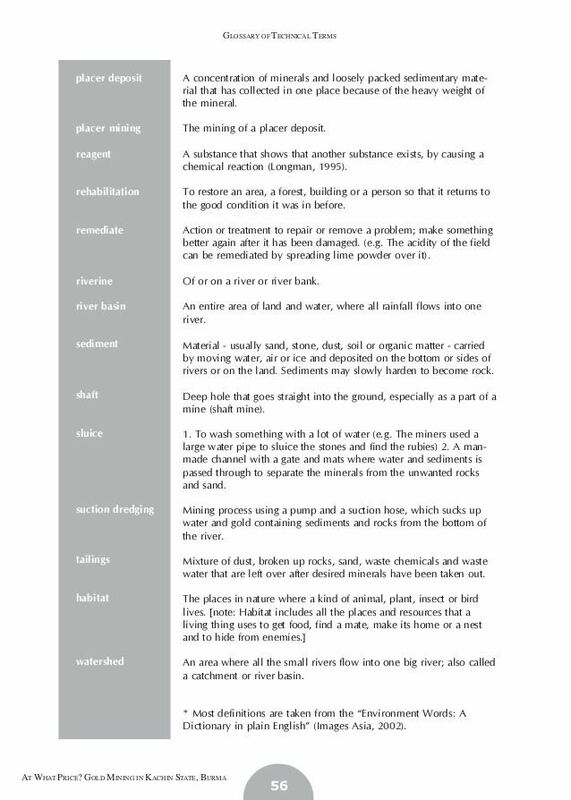 Mineral products include gold and jade. Hpakan is a well known place for its jade mines. Over 600 tons of jade stones, which were unearthed from Lone-Khin area in Hpakan aka Pha-Khant Township in Kachine State, had been displayed in Myanmar Naypyidaw to be sold in November 2011. Most of the jade stones extracted in Myanmar, 25,795 tons in 2009–10 and 32,921 tons in 2008–09, are from Kachin State. The largest jade stone in the world, 3000 tons, 21 metres long, 4.8 metres wide and 10.5 metres high was found in Hpakan in 2000. The Myanmar government pays little attention to the deterioration of environment in Kachin because of jade mining. There has been erosion, flooding and mudslides. Several houses are destroyed every year. Kachin has deep economic ties with China, which acts as the regions biggest trading partner and chief investor in development project. One controversial construction project of a huge 1,055 megawatt hydroelectric power plant dam, the Myitsone Dam, is ongoing. It is funded by China Power Investment Cooperation. When completed, the dam will measure 152 metres high and the electricity produced will be sold to China. This project displaced about 15,000 people and is one of 7 projects planned for the Irrawady River. Bhamo is one of the border trading points between China and Myanmar. There is a railroad between Myitkyina and Mandalay (through Sagaing). The train will takes 21–30 hours from Mandalay to Myitkyina. The Education system in Myanmar does not emphasis learning but rather memorization facts. in 1990's the Education minister asked all the states and division Education Chiefs to pass all the students who failed the mathematics examination with a score of at least 30 points though the normal passing score was actually 40. Educational opportunities in Myanmar are extremely limited outside the main cities of Yangon and Mandalay. It is especially a problem in Kachin State where over 60 years of fighting between the government and insurgents has displaced thousands of people. The following is a summary of the education system in the state. The general state of health care in Myanmar is poor. The military government spends anywhere from 0.5% to 3% of the country's GDP on health care, consistently ranking among the lowest in the world. Although health care is nominally free, in reality, patients have to pay for medicine and treatment, even in public clinics and hospitals. Public hospitals lack many of the basic facilities and equipment. In general, the health care infrastructure outside of Yangon and Mandalay is extremely poor but is especially worse in remote areas like Kachin State. The following is a summary of the public health care system in the state.